By Muhammad Panji in Internet. Updated on August 3, 2018 . If you run a small or medium business, an email service with custom domain can be pretty useful in streamlining coordination with your team. There was a time when you could get free email service from Google Apps or live.com with custom domain. 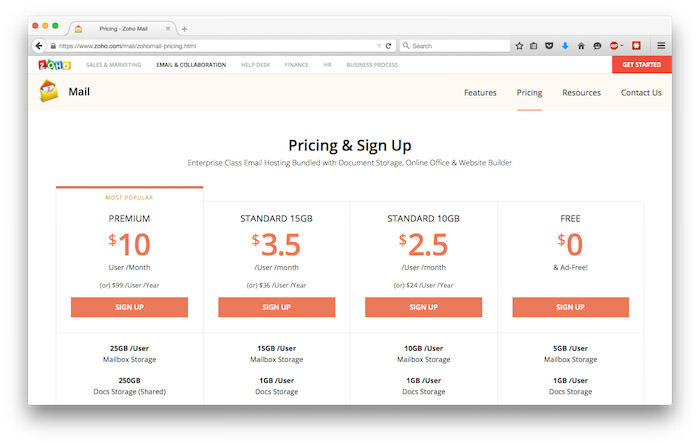 However, subscribing to paid versions of these email services might be too expensive. Fortunately, there is still one provider that offers free email service with custom domain, and a number of useful features i.e., Zoho Mail. In this article, we are going to guide you through different aspects of Zoho Mail and how to incorporate them. So, let’s take a look at the following. You might be wondering why you should use another email service while your web hosting also provides email service. There are several reasons why you should use email provider, especially cloud / SaaS service, like Zoho Mail instead of the one that your web hosting provides. More Inbox space per user. If you use email service from your web hosting provider, the inbox will be just a part of total disk space that they provide. If you have 10 GB disk space on the server and you already use 5GB for your website, database and contents then you can only use 5GB space for the whole company. With Zohomail you can give 5GB of inbox space to each user. Collaboration apps. It’s not only email, you can also use Zoho Docs and CRM and a lot of Zoho apps for collaboration inside your company. Additional users through referrals. By default you can get 10 user accounts in Zoho Mail, however, if someone registers to Zoho Mail from your referral, you can get up to 15 additional accounts for 3 referrals. Enter your domain name and click Add Domain. 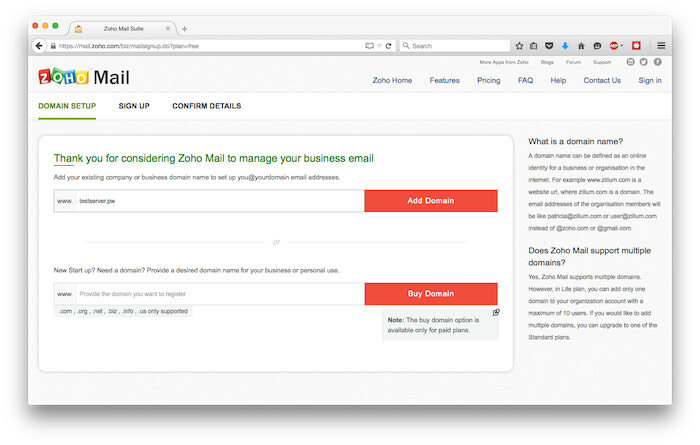 If you have no domain yet you can also buy domain via Zoho Mail. 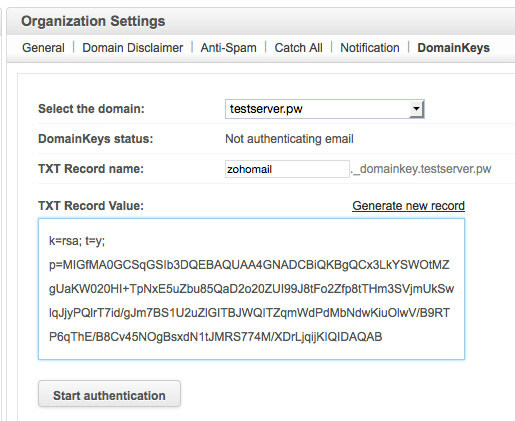 Below is a sample of alias / CNAME creation on Namecheap DNS panel. 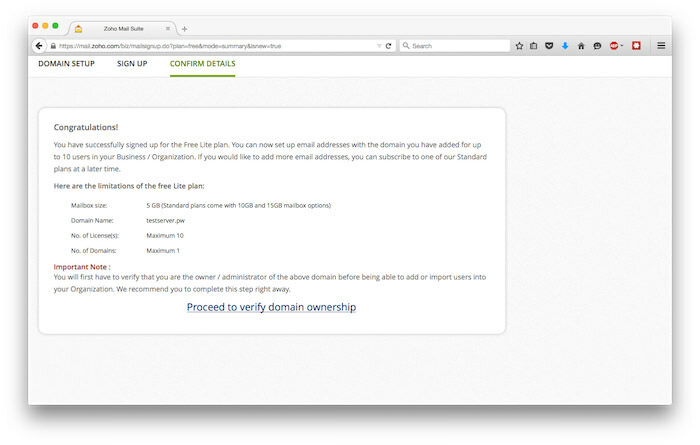 After registering Zoho Mail account for your domain and verify domain ownership, now it’s time to setup your account. Create your first account under your domain name. This is also your administrator for your account. You can add users in this step if you already have users. Groups are useful for generic address like info@yourdomain.com or finance@yourdomain.com, this will make sure that email that prospects or customers send is always read by someone in your team. 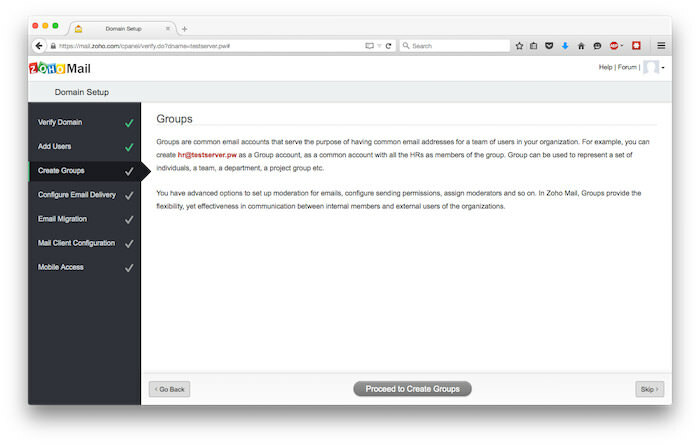 You can create groups in this page, however, in this article, I’ll skip this step. You can migrate your email from your web hosting provider to Zoho Mail. you can use POP or IMAP to migrate emails from your old mail server to Zohomail. As suggested by Zoho Mail it’s better to migrate the email after changing MX records. On this page, you can see links to tutorials for mail client configuration. If you prefer to use a desktop mail client, you can follow the manual for your mail client. Through this page, you can setup access from your mobile device. However, in this article we’ll skip this step. Sender Policy Framework or SPF is a DNS text record associated with domain to identify the servers permitted to send emails for the particular domain. 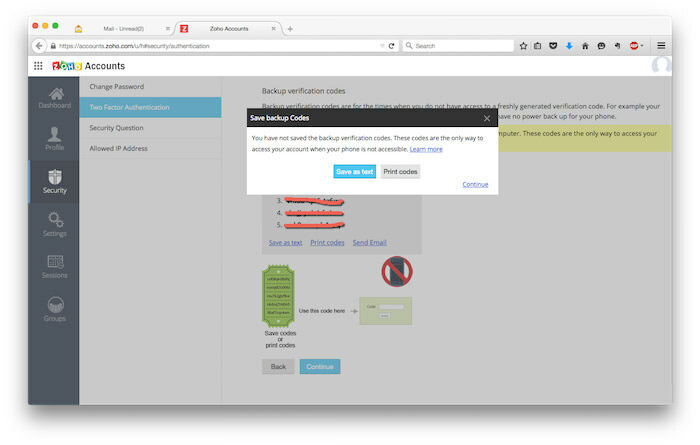 The recipient uses SPF record to verify that it’s a permitted server that sends emails to them. Below is a screenshot of TXT record for SPF record. DomainKeys Identified Mail (DKIM) is an email validation systems that was designed to prevent spoofing. The recipient will check for DNS entry that contains public key. Using this public key the recipient can verify that the message, including the attachment, is not modified during transport. We can use DKIM on Zoho Mail, and in the following we will show you how to execute its setup. 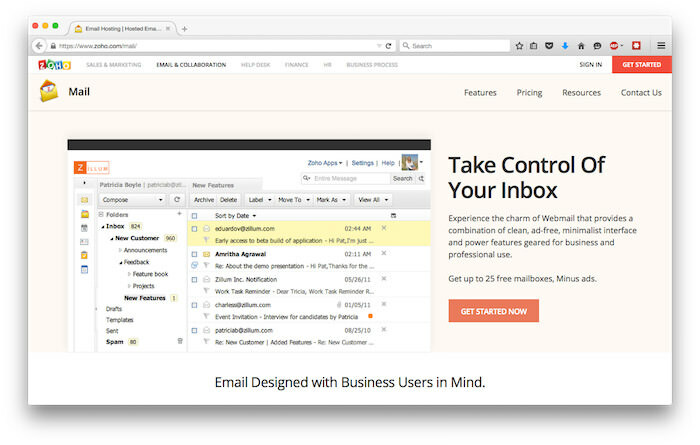 From your mail dashboard you can choose Control Panel > Mail & Docs. Choose Org Settings under Mail Administration, and then select DomainKeys Tab. 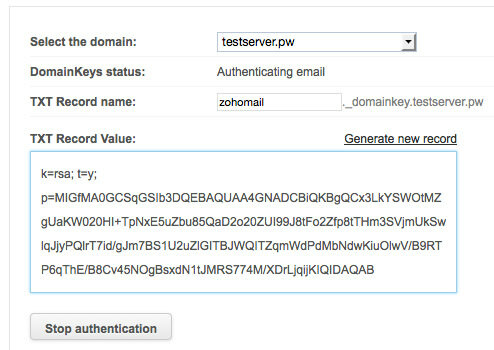 Input TXT record name, using a unique name to identify Zoho Mail, like zoho or zohomail (I’m using zohomail here). Click Generate new record to generate new TXT value. 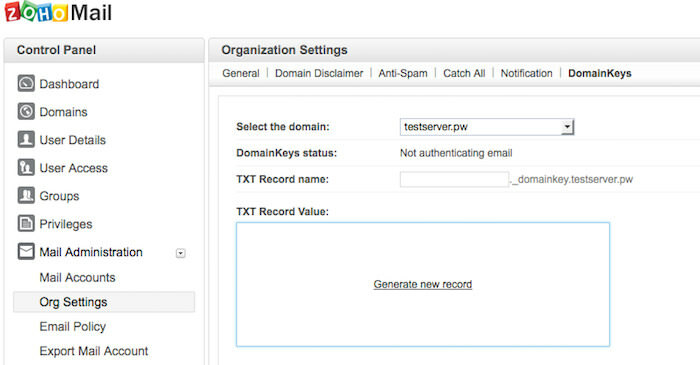 With a new TXT value created, you can now create new DNS record with type TXT record. Below is a sample of DNS entry on Namecheap DNS panel. 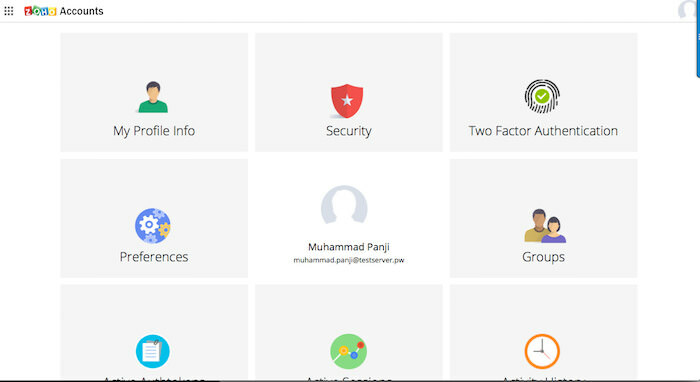 You can access Zoho Mail from https://www.zoho.com/mail/login.html or you can just open Zohomail.com and click Sign In on top right of the page. 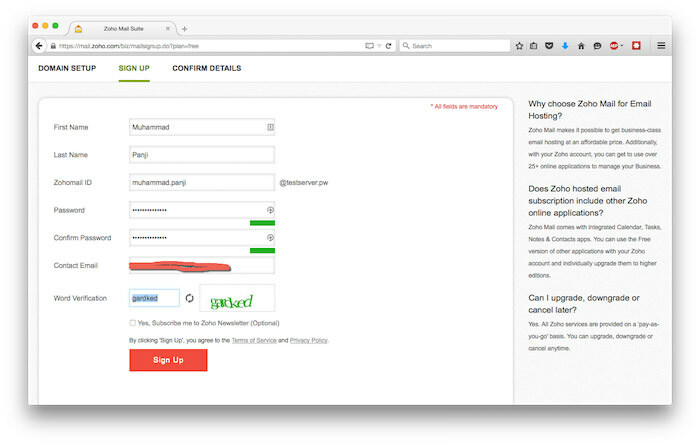 However, to make it easier for your users to access Zoho Mail web, you can create custom URL for the sign in page e.g: mail.domain.com or webmail.domain.com instead of the long URL above. What you need is to create an alias or CNAME for your custom URL to business.zoho.com. Below is a screenshot of CNAME creation on Namecheap domain management. 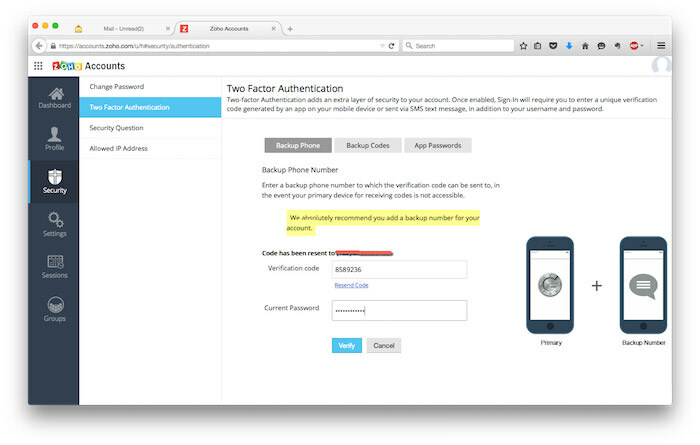 To improve the security of your email account, you can employ Two Factor Authentication or TFA, to have an additional security method beside the password. 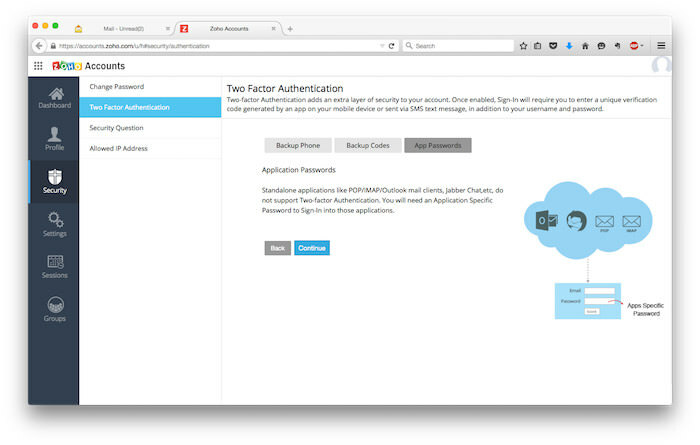 Even if someone knows your password they cannot login to your account as long as they have no access to the TFA device. 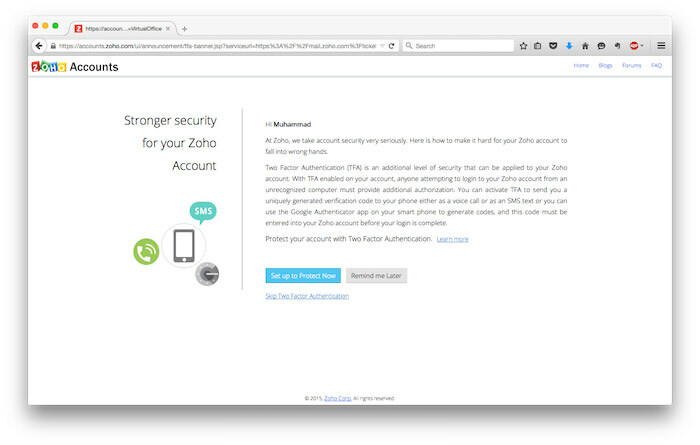 The following is an explanation on how to set up the TFA for your Zoho Mail account. Here, you will also be shown how to create MFA device using Android smartphone. 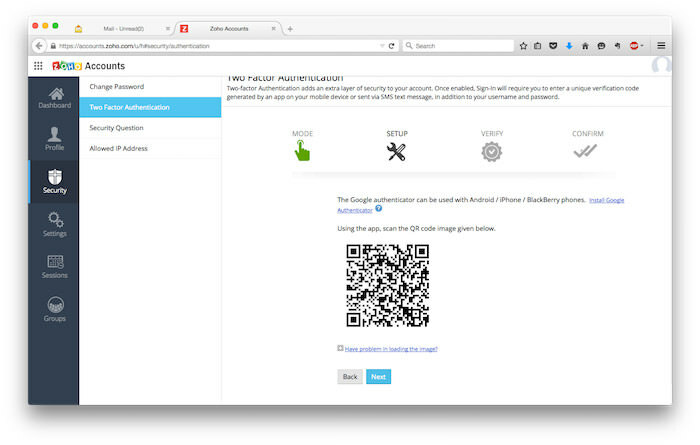 Open the Barcode Scanner so we can scan QR code that Zoho Mail has provided. I have two authenticator apps on my phone so I get this screen to choose between Google Authenticator and Duo Mobile. For this, I’ll choose Google Authenticator. TFA setup is almost complete. Now we need to verify the phone number. This step is optional, though. Input your phone number, and click Send code. Zoho Mail will send you a text message containing the verification code. 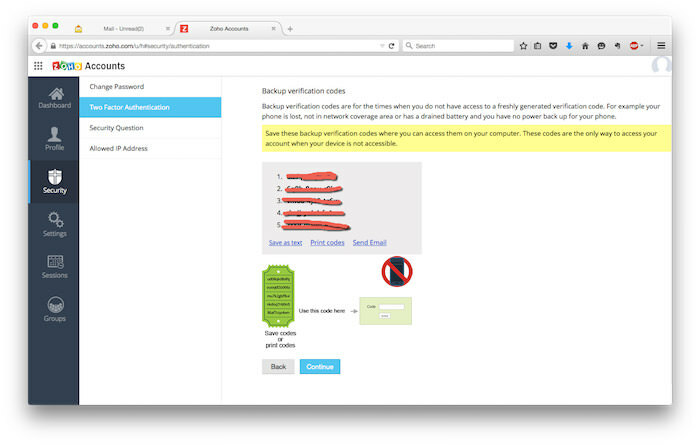 You will have the Backup verification codes. You can save these codes as text or get them printed. You can use these backup codes as authenticators, if you lose your phone. 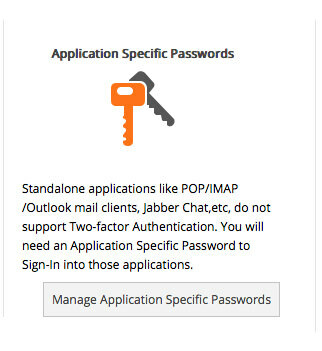 In case you are using Two Factor Authentication, you need to create application-specific passwords for each application that you use to access Zoho Mail, including your desktop mail client. To do sp, click Continue on this step. 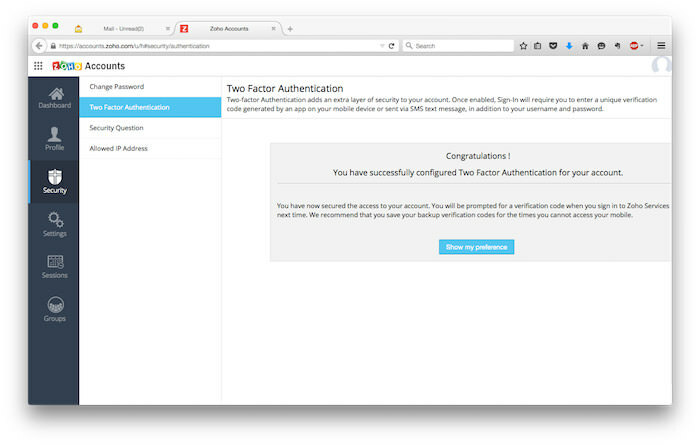 Two Factor Authentication configuration is finished. You can click Show my preferences to go to your preferences page. 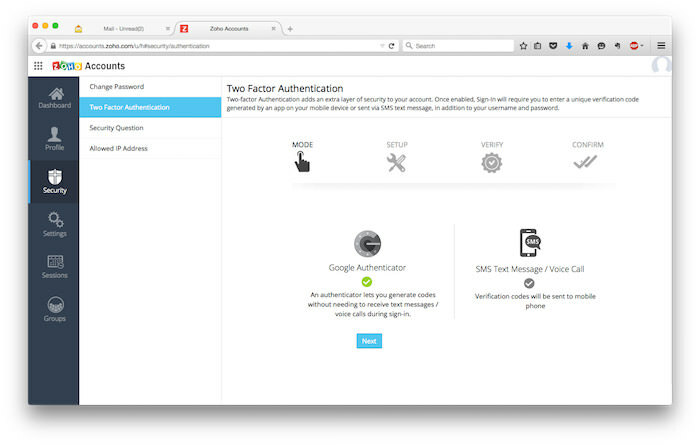 On Preferences page you can see your Backup Verification Codes, setting up Application Specific Passwords, as well as your current Trusted Browser. 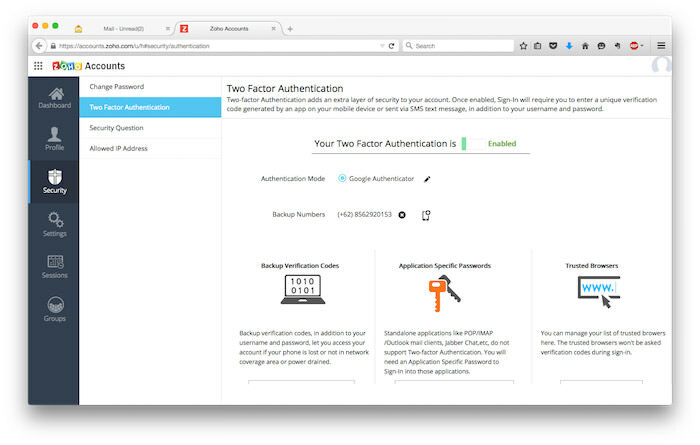 As I mentioned earlier, if you are using TFA on your account, you need to generate application specific passwords for each application that you use to access Zoho Mail. In the following steps we’ll learn how to execute it. 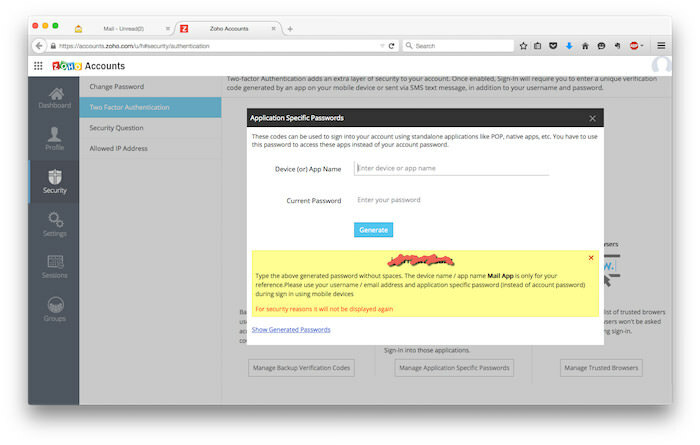 A new application specific password will be generated by Zoho Mail. You can only see this once, so make sure you keep the password saved. On the right bottom, you can click Show generated password link. 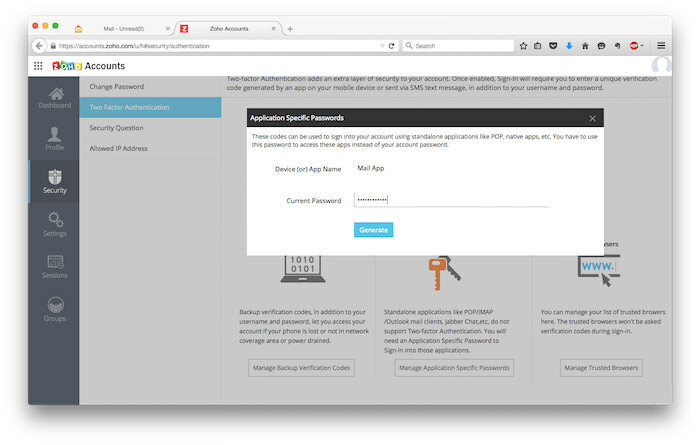 You can see the list of application specific password from here and also remove the password if necessarry. 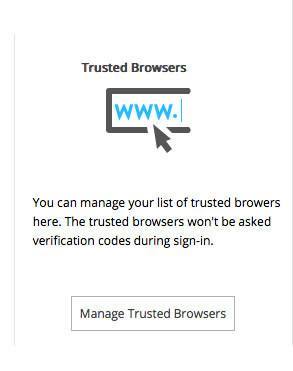 On this page, you can see a list of browsers that you trust. Here you can only remove a specific browser. Once you finish all the previous steps, your Zoho Mail account is ready to use. 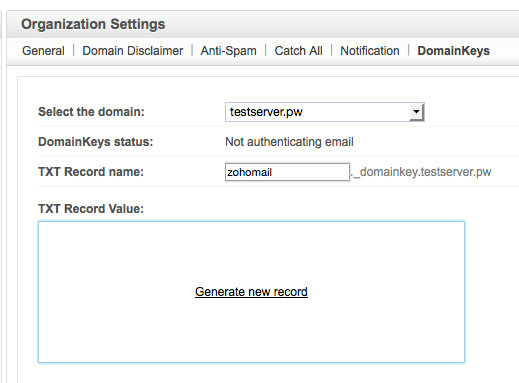 Now you can test your new Zoho Mail account by sending a test email. In the following example have sent a sample email to my gmail account. The email was successfully received by my gmail account. Now let’s check our SPF and DKIM settings. 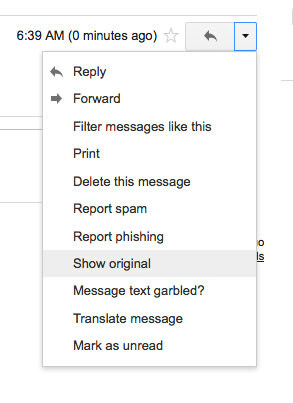 Click on the downface triangle beside the reply button, choosing Show Original. You can see here that Google has shown your SPF and DKIM configuration. In this informative article, I have tried to show you how to register new Zoho Mail, setup Zohomail MX, SPF and DKIM, create custom URL to access Zoho Mail, configure Two Factor Authentication, as well as test email sending from Zoho Mail. Now you can put your email address with your own domain confidently, and communicate seamlessly with your clients or team. Editor’s note: This post is written by Muhammad Panji for Hongkiat.com. Muhammad is a system engineer specializing in Linux,ÃÂ Virtualization, and Cloud Computing. He plays with new technology in his spare time, and maintainsÃÂ a blogÃÂ about technology in Indonesian language. You can find him on Twitter.